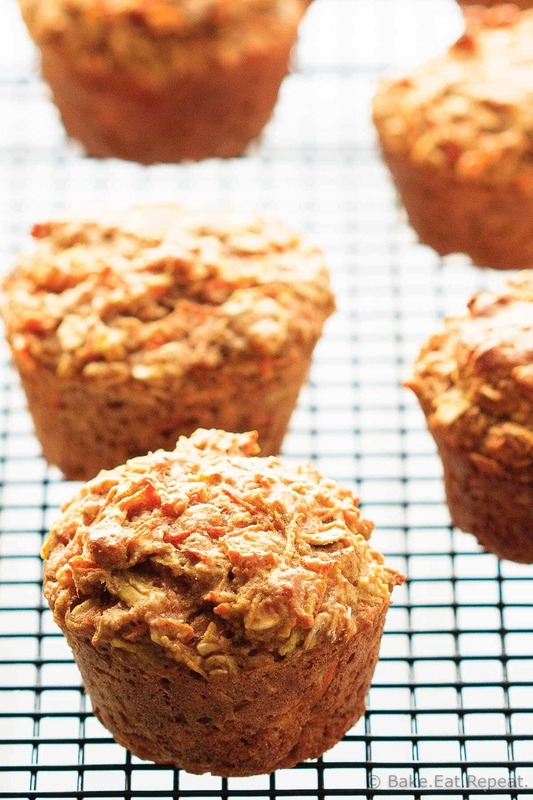 Healthy Carrot Zucchini Muffins - Bake.Eat.Repeat. 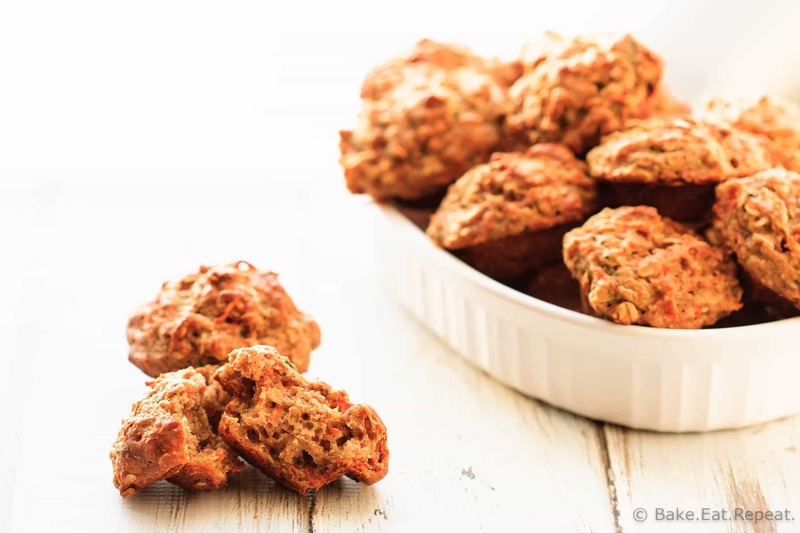 Healthy carrot zucchini muffins that make a hearty snack filled with veggies and whole grains that the kids will love! Perfect lunchbox snack! Does anyone else have a veggie hating child? I would assume that I’m not the only one, it seems to be a fairly common problem. My solution? Hide that healthiness in some cute little carrot zucchini muffins that they won’t be able to resist. Doesn’t always work, I’ll admit, but sometimes! Worth a try at the very least. My little guy actually wouldn’t eat these ones. But only because he helped me make them and saw all of the horrible carrots and zucchini go into the bowl. Plus, I grated them so there’s visible green and orange. We all know that that’s a no-no in the vegetable hating preschool world. Which is why I generally puree the veggies with the liquids in this recipe instead of just grating and stirring them in. It was wishful thinking that he would still eat them this way. Oh well, at least the other two are perfectly happy eating as many vegetables as possible, in pretty much any form. So they gobbled up these healthy carrot zucchini muffins quite happily. These mini muffins are on the savoury side as far as muffins go. They’re not a sweet, have with your morning coffee for breakfast, pastry style muffin. They’re hearty, full of whole grains and vegetables, with plain Greek yogurt instead of the usual oil or butter. Super healthy, and perfect for a mid-afternoon snack, preferably with a slice of sharp cheddar cheese. At least, that’s how I enjoyed them. The kids thought that was weird. They’re completely wrong on that. Now to make another batch (without my ever present preschool sidekick) and puree those veggies so the little guy will eat them. He’ll never know that he actually doesn’t like his snack. I’m sneaky like that. I’ve also shared this Healthy Carrot Zucchini Muffin recipe over on Food Fanatic. 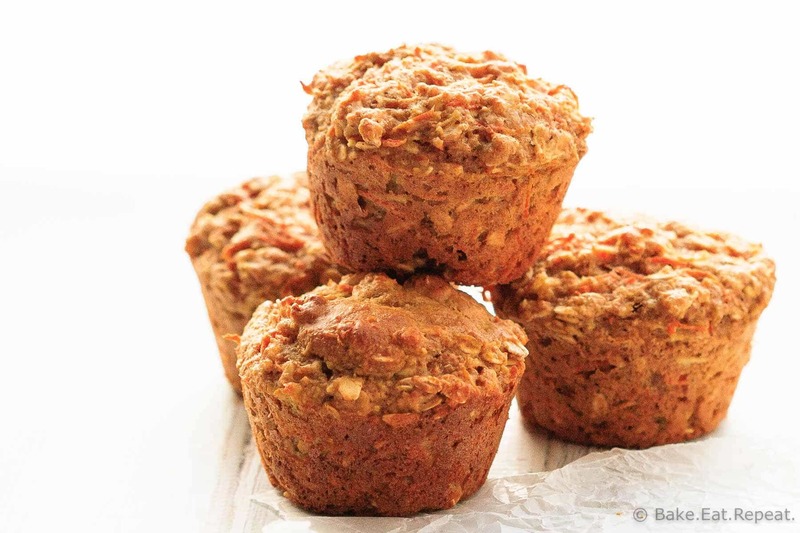 Love these savory muffins, especially since they're packed with so much healthy, veggie goodness! I must try these out! I love the looks of these savory muffins, Stacey! I've never had a combination of carrots and zucchini before, so I'm loving the veggies in here. Definitely a perfect treat to go along with my morning cup of coffee!